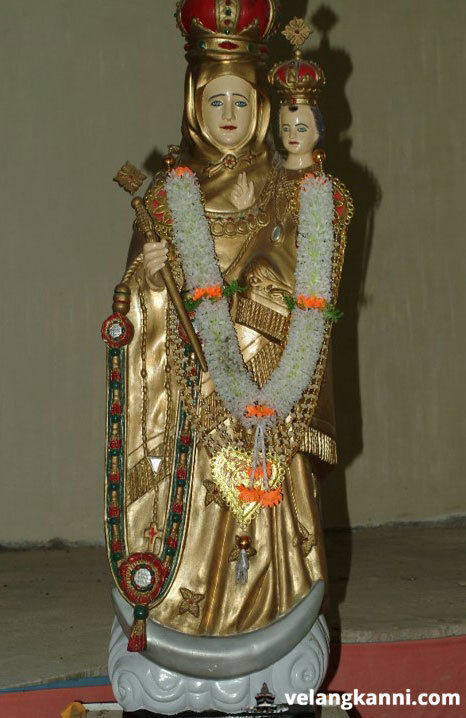 Miraculous Happenings At The Marian Shrine of Annai Velangkanni. 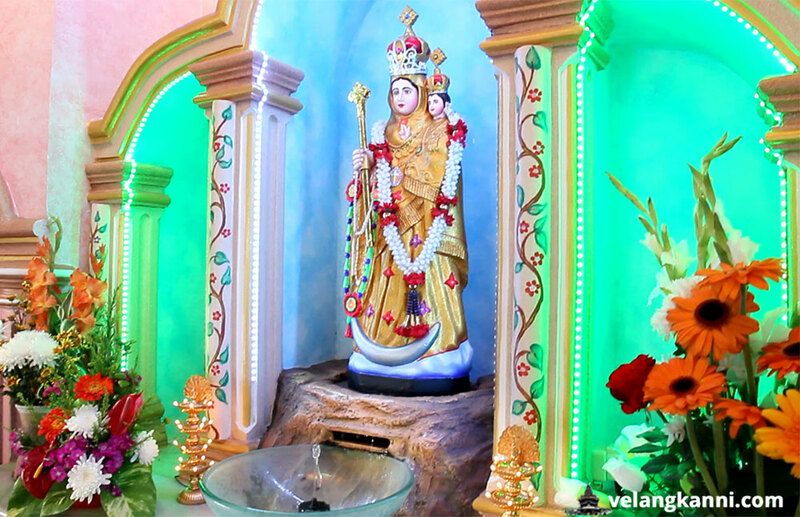 You are here: Home / Miraculous Happenings At The Marian Shrine of Annai Velangkanni. The Graha Maria Annai Velangkanni, which has not only become one of the most popular places for pilgrims in Indonesia but also a place where many people feel very close to God. The Graha Maria Velangkanni feels so peaceful and is where many miraculous happenings have occurred. 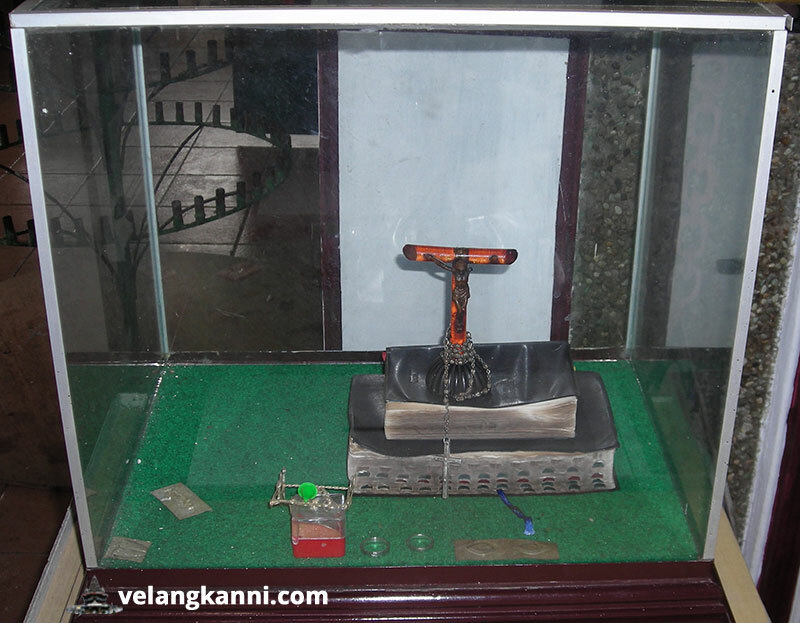 Three significant miracles are the miracle of fire, the arrival of the statue of Velangkanni and the natural spring water just underneath Velangkanni statue’s feet. 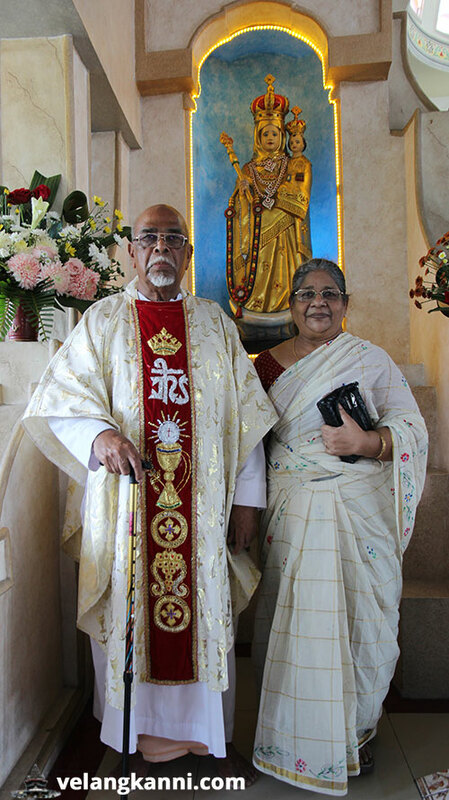 When his idea of getting some of the Tamil Catholic families that were squatting on the mission land in Kampung Kristen beside the Parish church of St. Anthony to settle in the piece of land in Tanjung Selamat which he bought failed, Father James was sent to Acheh in 1979 where he stayed for 8 years and then to Papua New Guinea for 3 years. Whenever he visited Medan after he left the Hayam Wuyuk parish, he stayed with the Sivanyanam family at No. 27 Jalan Kediri, Medan. It was his home in Medan whenever he came to Medan. Sometime on 30/10/2002, Father James had just returned from Acheh where he went to see his former parishioners to collect donations for the construction of Graha Maria. He managed to collect 10 million Ruppiah in cash. He wrapped the cash in foolscap paper and towel, and placed it in a plastic bag and left it on the table in his room. He had to fly off to Jakarta the next day and hence had no time to bank in the money. 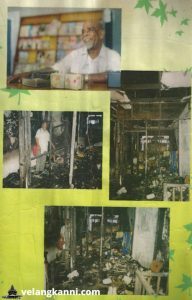 On 2/11/2002, he received news that his room was destroyed by a fire. He rushed back and found that the entire room was destroyed – the table, bed, books, clothing etc. He was devastated thinking that the money too could be been destroyed by the fire. He then entered the place looking for anything that could be saved and as he was sieving through the debris, to his surprise, he recognized the paper in which he had wrapped the cash in and found that cash remained intact. Not a rupiah was burnt. The towel, the plastic bag and the table on which it was placed was completely burnt. Together with the cash, 2 bibles and one hymnal were not damaged at all. The local newspaper ran a story on the fire and the construction of a Church in honor of Annai Velangkani and from that day money came pouring in until the completion of the Church in 2005. 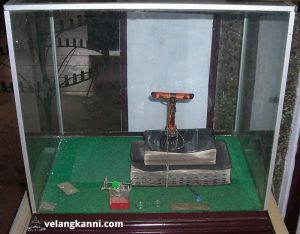 One of the Bible is now being displayed in the main altar of the church, while the other Bible and the hymn book is displayed in a showcase placed on the left of the entrance to the chapel of Annai Velangkanni. Fr. James’s vision was to built a grand church and the statue in the chapel then was too small. He asked his cousin in Chennai to buy a live size statue to send by air freight to Medan. He wanted the statue to be in Medan in time for the blessing of the chapel and the laying of the foundation stone for the church (the event). However, the statue could not be sent as it was an unaccompanied cargo. Fr. James and his congregation become anxious. He started a Novena at the chapel for the arrival of the statue before the event. The event was drawing near but no sign of the statue. On the day of the event, Fr James planned a procession to simulate the journey of the statue from India to Medan. 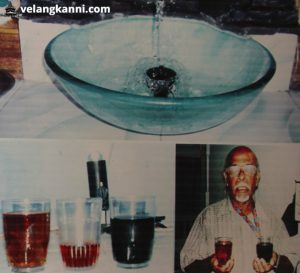 The event was scheduled at 5.00 pm on 8 September, 2002 the feast day of Annai Velangkani. A stage had been set to place her if she arrives. To everybody’s surprise, Fr. James received a call from Medan airport informing him that a statue has arrived from India and to come and collect it. The Statue of Annai Velangkani arrived at the nick of time. This miraculous arrival confirmed the divine encouragement of the Mother for the construction of the Graha Maria. How did the statue get to Medan? A lady by the name of Lourdumary from Medan went to India to visit her family. She heard that Fr. James had ordered a statue and since she was coming back for the feast day, volunteered to carry the statue back with her. She was stopped at the airport because of her baggage weight as the statue was heavy. She had no money to pay for the extra baggage costs. In desperation, she went to the Malaysian Airlines airport manager who happened to be a Catholic gentleman by the name of Lazarus. He waived the baggage costs and the statue was put in cargo. Unfortunately, the statue was not checked in directly to Medan and the statue needed to be off loaded in Kuala Lumpur. Again when Lourdumary went to check in, she was charged for extra baggage. She was upset and was crying when a cleaner lady approached her. She introduced herself as Arokiamary (the Tamil name for Annai Velangkani) and consoled her and took her to the airline counter again. The officer at the counter then said that she can only help if they can find a passenger without baggage check-in and going to Medan as well on the same flight. Again disappointed, both Lourdumary and Arokiamary looked around hoping at all odds to find such a person. Just then a young Muslim man passed by and Lourdumary had a hunch that he was an Indonesian going to Medan. She approached him and told him the story. The young Indonesian man had been working in Malaysia and was traveling back home for the weekend to see his parents, and had no luggage. He immediately, without any questions, obliged. The statue was then checked in with his ticket and Annai Velangkani was on her way to Medan without incurring extra baggage charges. Lourdumary was so grateful to Arokiamary who helped her. She went looking for her but Arokiamary disappeared. Only then did it occur to Lourdumary that Annai Velangkani had come in the form of Arokiamary to make sure that her Statue arrived in time in Medan. One week following the grand inauguration of the Shrine on 1 Oct 2005, the floor of the Marian Chapel began to be flooded with water. Even after the low floor was pulled off and a high floor was installed, the floor continued to remain wet all the time. Not knowing where it came from Fr. James called two water diviners to see if there was any source of water nearby. Both showed the same spot below the altar of Mary. Unwilling to break the altar down, a bore was drilled just 1.5 meters deep to see what is beneath the ground. The water was found to be murky and smelly. On 2/11/2005 at 2 am, Father James had a dream and was told to scratch the spot under the feet of Mother Mary below the chapel altar. The next morning, the exact date and month of the miracle of fire, a hole was dug at the spot and out gushed crystal clear water with a pleasant taste. The water diviners dug a well 3 – 4 meters deep and every time they emptied the water it began to fill up. The water was sent to the PDAM Tirtanadi water department for inspection. The lab at the Water Department confirmed that the water was clean from germ, and safe to drink. Father James closed the well and diverted the flowing water to a tank and made a special area for the people to collect the water. After hearing the news, people of all religions and walks of life came from far and near to pay homage to Mother Mary and drink the miraculous water. Many have been healed after consuming this water. The water from the underground spring has not stopped flowing since then. The faithful are now using the water as healing holy water. For those who believe, there’s a healing power in the water. 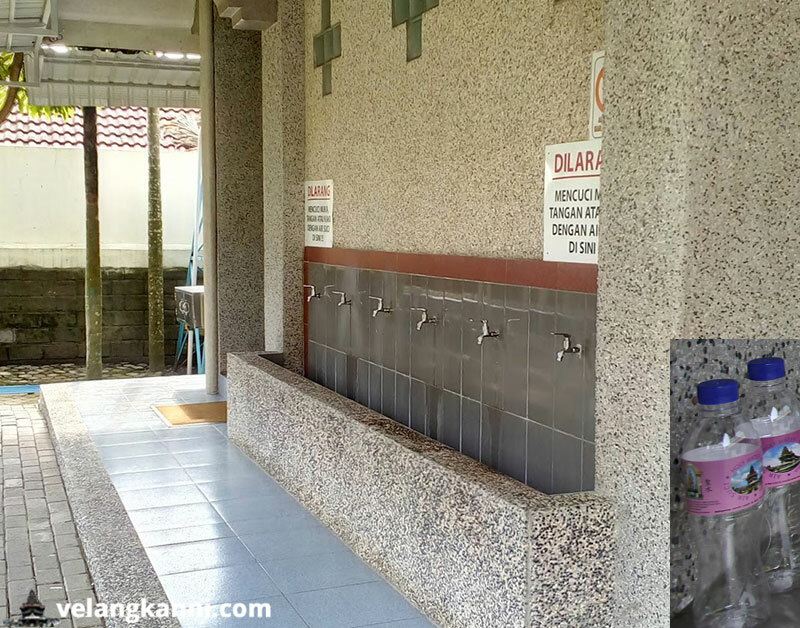 This holy water is now piped to a collection area at back of the chapel and visitors can bring home the water. Container bottles are made available at the side of the water collection area.